For most outdoor enthusiasts, building a campfire is one of the most pleasurable parts of immersing oneself in the woods. Whether you are building a fire for comfort or survival, there is definitely a right way and a wrong way to get a good fire started, and learning the basics of building a fire ahead of time can save yourself from suffering a little embarrassment on your next camping trip. There is nothing quite as satisfying as being able to start a nice fire by using a single match, and this is a pretty easy bushcraft skill to learn if you are will to take some time learning the basics. Here are a few tips that will help you make a great fire for the night in five minutes or less. 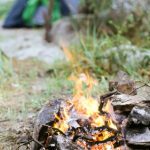 A common mistake that experienced and amateur campers alike make when they are building a fire is trying to start a fire before they have gathered all of the firewood that they are going to need. Some small twigs will be necessary for constructing the base of your fire, but you will want to be sure to get a good supply of larger kindling as well. Focus on gather sticks that are about as thick as your fingers first, and then gather a number of pieces of wood that are around the thickness of your wrist. Finally, be sure to find some larger firewood that you can throw onto the fire once you’ve built it up a bit. The number one thing factor in building a successful fire is building a decent base for the fire before you try to light it. Opinions very on exactly which designs are best for constructing a campfire, but the main point is to build a base that will allow your fire to breath properly. Folks who do not have much experience in building fires often try to make a fire based on a simple pile of sticks only to discover that it is very difficult to get the fire to spread properly. By building a base for the fire in the shape of a teepee or log cabin, there will be plenty of oxygen available in the center of the fire to allow your fire to spread more efficiently. For safety purposes, be sure to clear the immediate area of where you are building your fire of flammable debris like sticks and leaves, as well as anything that might cause anyone to trip and fall near the fire. One of the keys to getting a roaring fire going quickly is using some simple forms of fuel that help your kindling start burning once you apply a match. Purists may argue that the use of fire starters goes against the principles of true bushcraft, but most campers simply want to be able to build a successful campfire without much fuss. Although commercial fire starters are available in most sporting good stores and outdoor outfitters, it is easy to make very effective fire starters out of common household goods. One of the most popular ingredients for homemade fire starters is dryer lint. Dryer lint burns at a fairly high temperature and is very light to carry on extended backpacking trips. Cheese curls are another excellent type of fire starter that burn much more slowly than the dryer lint due to the high amount fatty oil that present in these snack foods. Some new campers tend to get a little over enthusiastic when they are building their first campfires. While it might be tempting to build up a roaring bonfire from time to time, these fires are impractical for a normal campsite. Not only will a big fire cause you to go through your fire more quickly and provide a larger safety hazard, a huge fire can be a little overwhelming when you are trying to relax at your camp. The best campfires consist of only two or three slowly burning logs once they get going, which provides an average camp with all of the warmth that it needs while letting everyone enjoy each others company around the fire.